The Arlington ISD needs your input. A new bond program is currently being developed to address facilities, fine arts programs, transportation, technology and security needs. Please help the district prioritize needs and make plans by taking this survey by April 21. Please note, this is not the same survey that was issued in February. This survey builds on the results of the February survey plus additional work that has been done since that time. 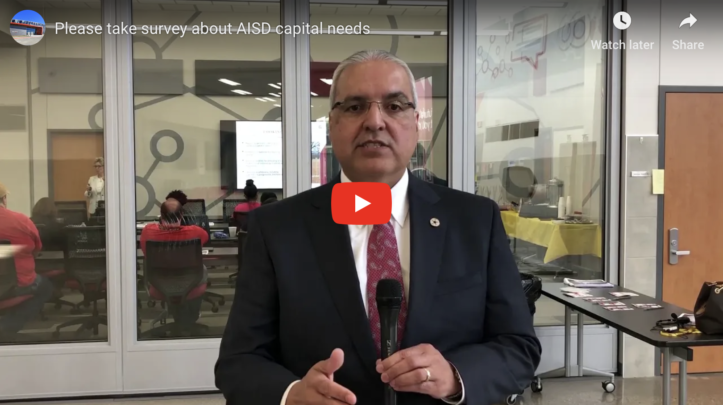 To help provide context for the questions in this survey, check out the presentation from the AISD's community dialogue meetings held April 9 and 10. The Powerpoint presentation includes information about the district’s capital needs and options to address those needs in a bond program. The questions in the survey follow the order of the presentation. Your input will be collected and reviewed by the AISD’s Capital Needs Steering Committee (CNSC) and AISD administration. The CNSC is a volunteer committee comprised of community members and AISD staff charged with evaluating and prioritizing the district’s capital needs, which includes evaluation of buildings, transportation, security, technology and more, through 2025. Through a series of meetings, community dialogues and surveys, the committee is reviewing and analyzing the district’s own capital assessment and listening to the community’s priorities and questions. In June, the committee will report its findings to the AISD Board of Trustees and potentially offer a recommendation for a bond program to fund the priorities. Next Annual Media Fair April 23!